Lead Drummer J. Reid Maxwell is certainly one of today's most decorated drummers. 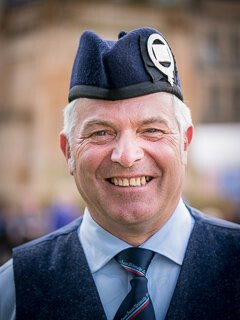 When the SFU Pipe Band captured the Worlds in 1995, Reid became the first person in history to lead the drum corps of two different bands to be named World Pipe Band Champions (his other victory being in 1987 with Toronto's 78th Fraser Highlanders, also the 1987 World Drum Corps Champions). And all this was preceded by two World Pipe Band Championships and four World Drum Corps Championships as a member of Scotland's Dysart & Dundonald Pipe Band. With the band's capture of the 2008 and 2009 World Pipe Band Championship and World Drum Corps Championships, Reid obtained his 18th World Championship title, an amazing feat by any standard. Reid's ability to produce exceptional drum corps and his dedication to the instruction of young drummers is held in high regard worldwide. In 2015, Reid was awarded the BC Community Achievement Award for services to pipe band drumming in British Columbia.